Quickly jot down notes and reminders for later (was Menu Tab Pro for Google Keep). Is there a better alternative to Notes for Google Keep? 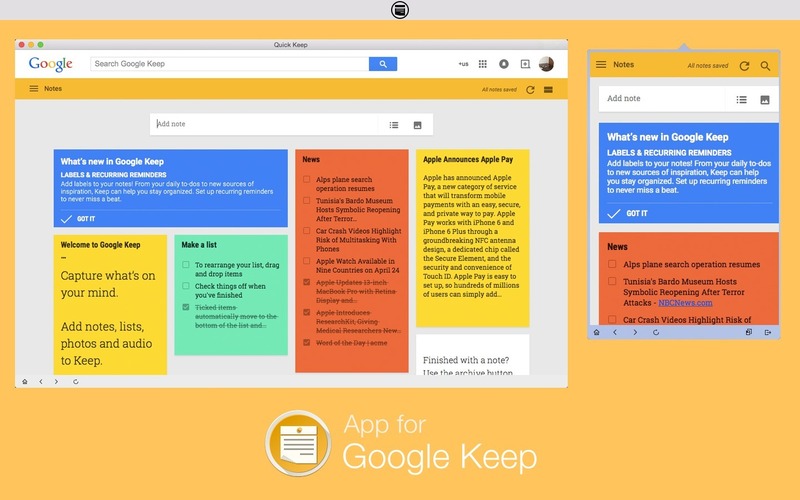 Is Notes for Google Keep really the best app in Productivity category? Will Notes for Google Keep work good on macOS 10.13.4? Notes for Google Keep (was Menu Tab Pro for Google Keep) (was Quick Keep) lets you quickly capture what's on your mind and be reminded at the right place or time. Create a checklist, enter a note or snap a photo and annotate it. Notes for Google Keep needs a review. Be the first to review this app and get the discussion started! Notes for Google Keep needs a rating. Be the first to rate this app and get the discussion started! Use your notes from anywhere - they are safely stored in the cloud and available on the web at keep.google.com.